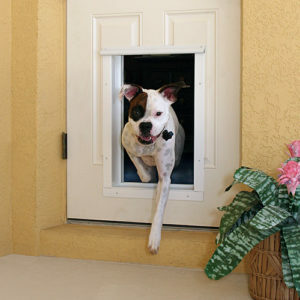 The panels swing easily, and a smaller and larger pet can share the same door. If you want the PlexiDor quality with automation, there is a version called the PlexiDor Electronic that operates with an RF-ID collar key. Instead of the saloon-style K9-Composite panels, the electronic PlexiDor has a durable, shatter-proof panel that opens like a garage door when the key comes close enough. The image belows shows the PlexiDor electronic from the outside of the house. The door is available for installation through a house door or a wall.